A two-year process including self-study and a site visit resulted in a seven-year renewal of accreditation for the Rollins School of Public Health. 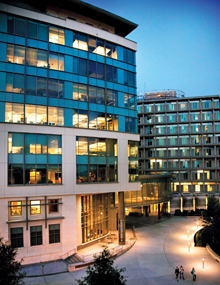 The Council of Education for Public Health (CEPH) has renewed the accreditation of Emory University’s Rollins School of Public Health (RSPH) for the maximum seven-year term. The CEPH Board of Councilors acted at its Oct. 11-13 meeting on the accreditation extending to Dec. 13, 2019. CEPH, an independent agency recognized by the U.S. Department of Education, reviews schools of public health for accreditation every seven years. For accreditation, schools are required by CEPH to conduct a self-evaluation and submit a self-study report detailing how the school meets each criterion. RSPH submitted its final self-study report to CEPH in March 2012. RSPH received a 'met’ finding on all criteria evaluated. This was RSPH’s fourth review for accreditation as a school of public health. The school was last accredited by CEPH in 2005. "We take accreditation very seriously here at the Rollins School of Public Health," says Richard Levinson, executive associate dean for academic affairs. "Meeting each criterion means that we have rigorously evaluated the quality and content of our instruction, research and service programs." A team of peer reviewers conducted an on-site visit to RSPH in April to validate the self-study findings. Schools are evaluated against criteria that establish expectations for the school’s mission, goals, evaluation and planning, as well as its institutional environment, organization and administration; governance; resources; instructional programs; creation, application and advancement of knowledge; and faculty and students. During the site visit, the team interviewed RSPH administrators, faculty, students, alumni, university officials and community leaders. The team also inspected the school’s facilities, examined documentation supporting the self-study and prepared a report of its findings. The accreditation process began in the fall of 2010, when a steering committee comprised of RSPH faculty, staff, students, alumni and community partners was formed to ensure broad representation in the self-assessment process. Supporting this committee was a seven-member working group that created the self-assessment document based on suggestions of the steering committee. "The CEPH site visit team was very impressed by the quality of our self-study and recognized the tremendous effort invested in the process by the steering committee and all members of the Rollins community," says Laura Lloyd, MPH, CHES, director of continuing professional education and coordinator for the RSPH self-assessment. Copies of the CEPH report are available from the school by request to the Office of the Associate Dean for Academic Affairs at rlevins@emory.edu.